These black glass skulls will prove to be a stylish addition to your displays - it’s a no brainer! Our recycled glass skeleton display heads are ideal for the retail environment and perfect for merchandising in shop window displays. 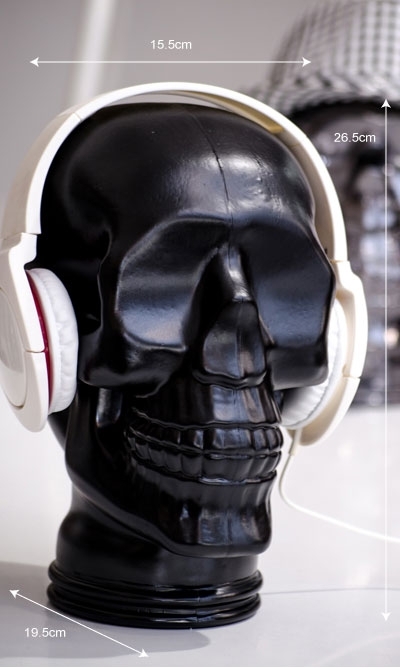 Create eye-catching point of sale; display your hats, headphones or sunglasses on these black glass skulls. Height - 26.5cm : Width - 15.5cm : Depth - 19.5cm. Available in various colours. These black glass skulls will prove to be a stylish addition to your displays - it’s a no brainer! Our recycled glass skeleton display heads are ideal for the retail environment and perfect for merchandising in shop window displays. Create eye-catching point of sale display your hats, headphones or sunglasses on these black glass skulls. Height - 26.5cm : Width - 15.5cm : Depth - 19.5cm. Available in various colours.